1. Ok the “trigger” for the market falls is simply US political uncertainty– but once the dice is cast - the selloff can very easily take on a mind of its own. 3. The drama in the White House is now taking centre stage - which includes not only all the allegations of impropriety and obstruction of justice/abuse of power conversations-but it is also about Trump’s inability to 'get along' and implement all of those policy initiatives he ran on. 4. Some lawmakers and legal experts believe this alleged incident may qualify as an obstruction of justice, which is considered an impeachable offense. 6. For investors, the concern at hand is that an investigation into the matter could derail tax reform efforts, which have already been slow to get on track. 7. The US stock market has risen sharply since the election, bolstered to a large degree by the belief that tax reform, deregulation, and infrastructure spending will fuel stronger economic and earnings growth. 8. That view has manifested itself in stretched equity valuations; therefore, the assumption today that the Trump Administration's pro-growth policy agenda could be at risk of not coming to fruition drove a broad-based selling effort as valuations got called into question & that question will continue to get more air time over the next month. Gold the traditional safety play in times of anxiety - is up US$23 last night at US$1,260/oz , and is now up US$40 in the last 5 days straight. Gold which will see further buying, has gone above its 200 day moving average..
That should be seen as another warning bell, because if investors were not concerned about the drama doing on it the White House - then they wouldn't be buying gold. 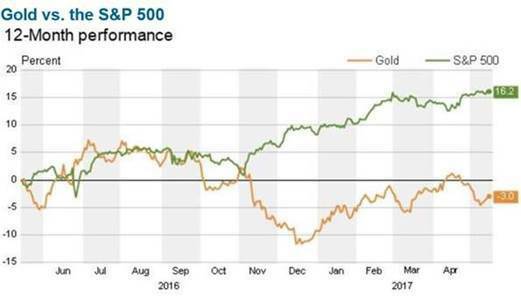 If US is going to correct (which I think it will from here) on Trump worries & delays to his agenda + valuation concerns etc..
Then look at how gold & S&P 500 divergence began when Trump was elected ..